Ridge Farm High School "Bulldogs"
Ridge Farm (population 912) is located in far eastern-central Illinois. Ridge Farm is situated along U.S. Route 150 about 18 miles south of Danville. The town is nestled in the southeast corner of Vermillion County about five miles west of the Indiana/Illinois border. Two railroad lines intersect on the northwest side of town, the Conrail and the Norfolk & Western. An 1854 map of Edgar County, Illinois, clearly shows the town of Ridge Farm, already established, to the north, in Vermillion County. The history of the town and its educational system is in need of research. 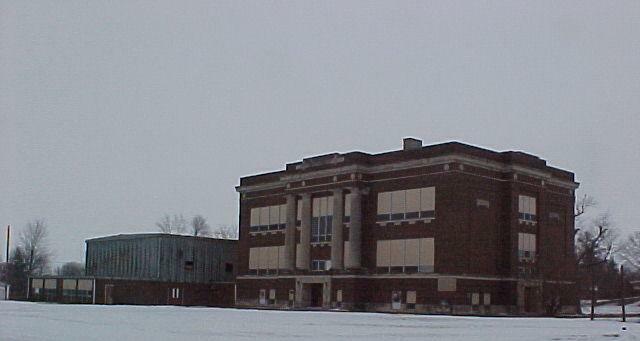 Ridge Farm High School was established in 1890. It served the communtiy for for nearly 100 years. In the mid 1980s the towns of Georgetown and Ridge Farm began consolidation talks. Their efforts became a reality in the summer of 1986 with the creation of the Georgetown-Ridge Farm School District. "I was born near Ridge Farm, raised in the community, and attended my 12 years of school in the community. 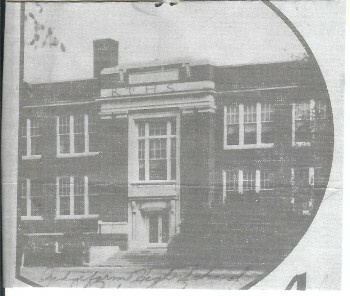 The first eight years were in the grade school building. Students who graduated when on to high school in the building across town. I graduated from high school in 1957. 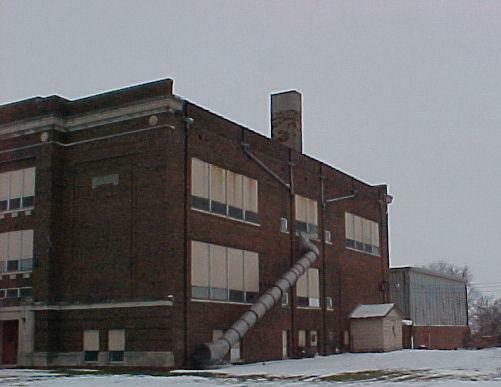 The high school building was torn down several years ago to make room for the new elementary school which is part of the Georgetown-Ridge Farm school district. Each year the weekend before Memorial Day, the Ridge Farm Alumni Association holds a banquet for the alumni of this school system. The banquet is held in the old gym that was not torn down when the high school building was demolished. 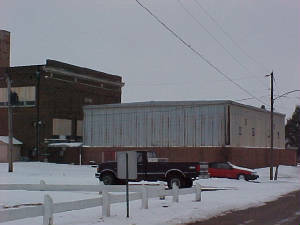 The Gym was added to the old high school in the mid-1950s. The children attending school in the new building still use the gym and the classrooms that were added to the old school. My children attended schoolin the Ridge Farm School system and were a part of the transition made to the consolidated school system. They missed the uniqueness of a small school and the friendships that are easily made with a smaller system. Byt, as we know, time changes everything. Ridge Farm School District was a good district to attend. The people there took pride in theier sports and musical programs. Not many schools offer what this school did being as small as it was." The high school for the new district is located in Georgetown. The original high school building in Ridge Farm has been razed. The gymnasium is used by the students of the new grade school (K - 4) built on the old high school grounds. School Fight Song: "Cheer, Cheer for Old Ridge Farm High"
The Ridge Farm Bulldogs had many successful seasons throughout their storied history. The boys competed in basketball, track, and football while the girls competed in volleyball, basketball, and track. Other sports may have been offered as well. Conference affiliation, championship teams, and great coaches are all being sought. The Ridge Farm boys tracksters of the 1910s and 1920s were a very competitive group. The boys of this era brought home a total of nine individual medals. The team of 1912-13 finished FOURTH at the State Track Meet!! This was accomplished in a one-class format! All of the points for tihis finish were earned by an athlete named Henderson. The medal winners and team standings are listed below. 1912-13 Team Finished FOURTH at the STATE TRACK Meet!! ?? Henderson 1 Mile Run STATE CHAMPION!! ?? Fletcher High Jump STATE CHAMPION!! The Lady Bulldogs basketball program brought home a Regional Championship in the early 1980s. Unfortunately the team records and coach's names of these and other great girls basketball teams are not currently available. The boys also had some great teams in their history. The Bulldogs of the late 1940s and 1950s were said to be very competitive. The 1960s saw some great teams as well, including two District titles. The records that are available are listed. Coach Keith Baldwin had some real nice success in the 1960s as well and he wold go on to have a career coaching record of 476-233 until retiring at Watseka in 1991. The Lady Bulldog netters finished out the school's history with a bang. The program won three straight Regional titles including one in the school's final solo season. Coach Donny Hackler led the led the Lady Bulldogs through their final four incredible seasons, allowing the Ridge Farm volleyball program to go out on top! The football teams of the 1950s were said to have had winning records each year, perhaps even a conference championship or more. More information is needed on the team records and coaches names of these teams. Some of the better team records and accomplishments are provided by the research of Tom Sikorski. *Rusty Rumple - set Ridge Farm records for passing and points in bassketball as well as track & field records. *Donny Hackler - Set Ridge Farm track & field records. *Ronny Farris - Set Ridge Farm track & field records. *Don Farris - Set Ridge Farm track & field records. "I was a member of the last class to attend Ridge Farm High School. I grew up there and played sports. I can provide a lot of info about the sports and coaches. 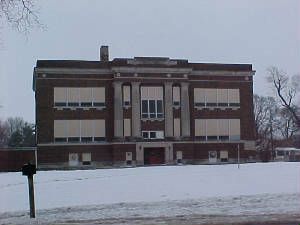 I also have many pictures of the old High School. My father, Keith Rigdon, was a member of the 1965 Football team and was named to the Little All-State Team as a Center. Other notable athletes included Steve Spesard who broke the state single game scoring record with 63 in one game, before there was a 3 point line. He was named all-county, all-conference, and earned all-state honors."